Successful at love. Is there anything this woman can't do? She's Martha Stewart with an Oscar (and every other possible award on the planet). The Four of Wands represents Success. Success entails many things. Having a lot of money, or the respect of your peers, or freedom to do what you want with your life, or awareness of being the best in your chosen field(s)--these are only parts of success. You are not successful if you are not also happy. 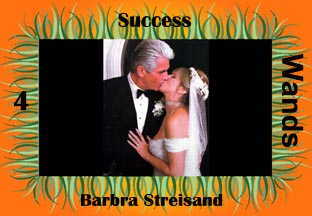 The bells were ringing for Barbra and Jim at BJS Web: The Barbara Streisand Web Page.